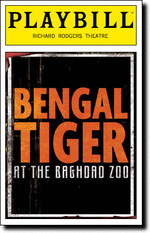 Two homesick American soldiers, a tormented Iraqi and a displaced tiger collide on the streets of Baghdad in this arresting play set against the backdrop of the Iraq War. Robin Williams is a charmer in this morality play based in the Iran war. His Bengal Tiger helps to ground the somewhat tangles story lines by providing the conscience and the heart of the play. His dialog's message is considerably more concise and streamlined than that of his fellow actors and is thus able to convey the awful ironies that such a war inevitably creates.